Perfect for lounging in any position, the Fatboy Original 6-Foot Extra Large Bean Bag Chair is oversized to mold to every inch of your body. You’ll achieve instant relaxation floating on this cloud of soft polystyrene beads that provide support with zero pressure points. 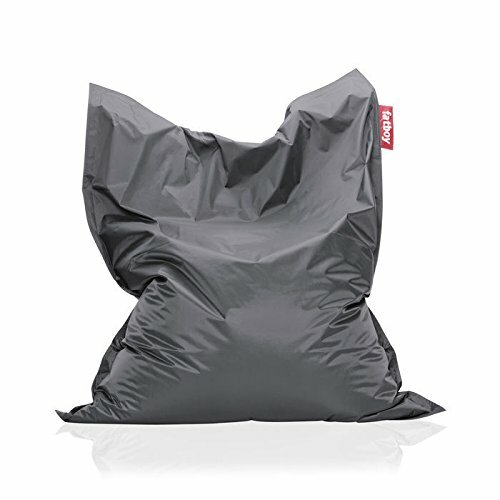 Instead of the typical bean bag sphere, this chair is designed like a giant rectangular pillow to deliver unique comfort in an iconic package. Available in a variety of fashionable colors, this bag’s durable nylon cover is resistant to spills and wipes clean with a damper cloth. In accordance with the Consumer Product Safety Commission, this bean bag features a resealable safety closure. The closure seals each zipper and protects children from the age of 12 and younger. These world-famous decals hardly need an introduction, but we'll tell you about them anyway because they're that awesome. Bringing sports heroes, movie characters, and more into full-size real-life detail, these high-definition decals bring fandom into a new dimensions. Using state-of-the-art printing on heavy-duty vinyl, Fatheads wall decals are unlike anything you've ever seen on the wall. They go up and come right down at any time without damaging walls or paint, so feel free to express your fandom any way you like! Dimensions: 70L x 55W in.. Polystyrene bead filling conforms to your body. Water-resistant, PVC-coated nylon fabric. Available in a variety of bold and stylish colors. Wipes clean with a damp cloth. Morphs into an infinite variety of cozy shapes. Dimensions: 70L x 55W in. If you have any questions about this product by Fatboy, contact us by completing and submitting the form below. If you are looking for a specif part number, please include it with your message.